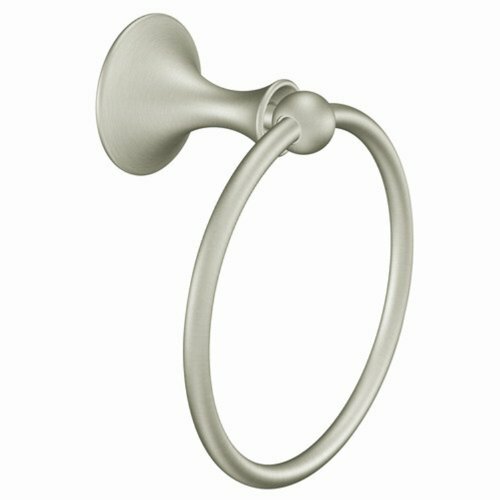 DN7786BN Finish: Brushed Nickel Features: -Included template and mounting hardware take the guesswork out of installation. -Lounge collection. -Metal mounting post for extra security. -Easy to install. -Corrosion resistant. Product Type: -Towel ring. Style: -Modern. Country of Manufacture: -United States. Mount Type: -Wall mount. Primary Material: -Metal. Dimensions: Overall Height - Top to Bottom: -7". Overall Length - Side to Side: -5.9". Overall Depth - Front to Back: -3.4".